Travelers' Tales and Solas House are trademarks of Solas House, Inc. 2320 Bowdoin Street, Palo Alto, California 94306. Credits are given starting on page 271. 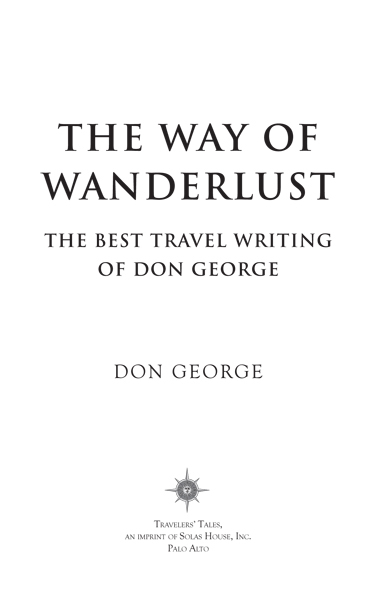 The way of wanderlust : the best travel writing of Don George / by Don George. -- First edition. 1. Travel--Anecdotes. 2. George, Donald W.--Travel. I. Title. it was one of those piercing, radiant early autumn days in Japan that leave you exultant and strangely wistful all at once. The sky was a richer, deeper blue than you'd see in California; the sun was so warm, even shirtsleeves seemed too much; most of Kyoto was spilling out into the leafy lanes, to enjoy yuzu-flavored “soft creams” and aloe-and-white grape juice cordials and the exhilarating buoyancy of a “second summer” Sunday afternoon scented with what smelled like daphne. Don and I sat out by a stream, the blaze of the sun beating down on us, and spoke of some of the wandering heroesâPeter Matthiessen, Jan Morris, Donald Richieâwho had sent us out into the world to be transformed. ” (or “anywhere you want”) door in his stomach. Both had found in Japan a way of making gentleness, courtesy, affirmation, and robust public cheerfulness seem not the stuff of childishness, but something seasoned and mature. But Don spoke perfect Japanese, as I could never dream of doing; Don had taught English here and appeared as a talk show host on Japanese TV. Don could open the door of any Japanese person we met along the streets, with his idiomatic, unaggressive, always smiling manner; it wasn't hard to imagine that he had taken the optimism and openness of his longtime home in California and somehow wed it to a natural sweetness and unintrusive sympathy I associate deeply with my home near Kyoto. As we sat in the sun, drinking tea made from maple leaves (seasoned with apple and apricot), as we meandered through the 19th-century European park that leads toward the tiny lane on which our favorite tatami tea house is hiddenâDon had come here ten months earlier to collect himself after his Japanese father-in-law diedâI thought how distinctive Don's relaxed and responsive spirit can be. I'd walked these same streets with other friends for twenty-seven years now, many of them celebrated travelers; they'd fired questions at me, shot out theories, spun this notion about Japan and that judgment. Don, by comparison, hung back. He seemed eager to take in as much as he possibly could. He didn't have agenda or preoccupation, and in that regard appeared to rejoice in the rare traveler's gift of allowing the day and the place to take him where they wanted him to go.
. 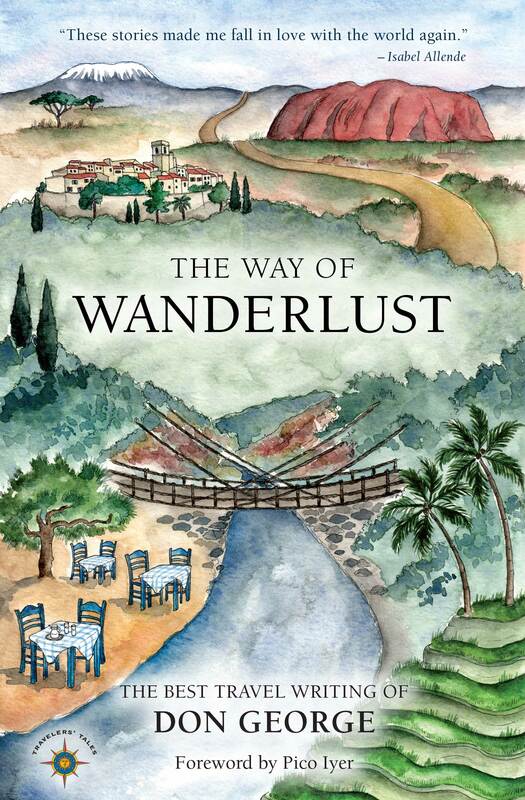 He reminded me of his early travels to Paris and Greece and then to an M.A. writing program in the hills of Virginia; by the time he was barely thirty, he had a lovely Japanese wife, a new perch in San Francisco, and a job that allowed him to call up writers as established as Jan Morris and invite them to write for his newspaper on the places that had changed their lives. “How's your mother?” I asked him, as we walked along the narrow, willow-lined lane of Kiyamachi, in central Kyoto, sidestepping girls in pinkly flowering kimono sipping at Starbucks's seasonal frappuccinos. ” The Japanese, not surprisingly, have a word for the strip of light the sun makes on otherwise chilly days, akin to the one where we had been sitting, by the stream.